1. We have just spent around 2 hours trying to download Emails/attachments that are too large to receive whilst we are out of our winter port. We can, and indeed do, put a limit on the size that is acceptable. But we still seem to be using up megabytes whilst the system is studying what to do. A crazy situation with 10.5 Mbs used this morning alone out of a daily allowance of 2Mbs! 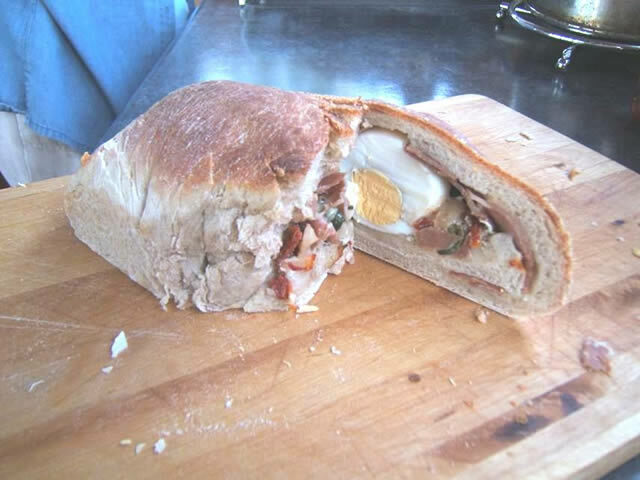 Sometimes it's an attachment (photo) that has NOT been reduced in size i.e. 40 or 50 times bigger than we want to download via our mobile phone. So in future a maximum size of 40 kilobytes for photos please. 2. Some Emails request that we forward them to friends - DEFINITELY NOT! 3. Warnings of hackers - we totally ignore these emails and delete them as they are probably NOT from whom they say they are from. On a general note, part of the problem is due to our laptop being about 7 years old. Most of our data has been put on external data sticks but this doesn't help much with an old weary machine. So please bear with us. 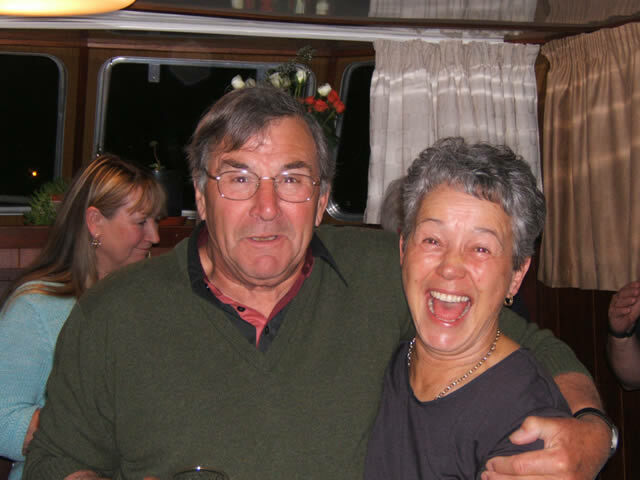 In our last update we mentioned that our friends Pete and Betty paid us a visit and, as you can see in our first photo, it didn't take long for the giggle juice to take effect. It looks like Pete came second in the silly hat competition! 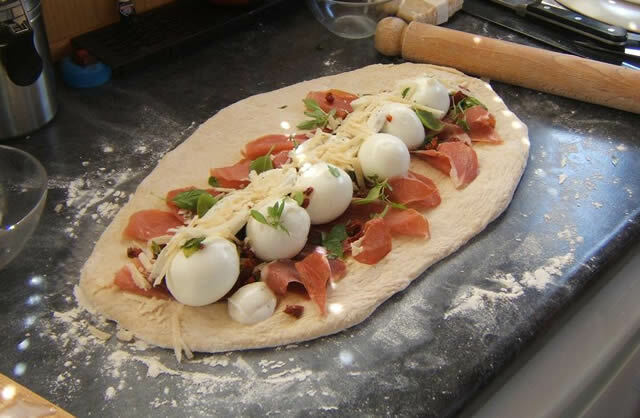 Richard and Vivienne decided to have an evening soiree and Peter and Betty thought that it made a perfect end to their visit. Pete did manage to get first prize this time though with his arm around Vivienne. 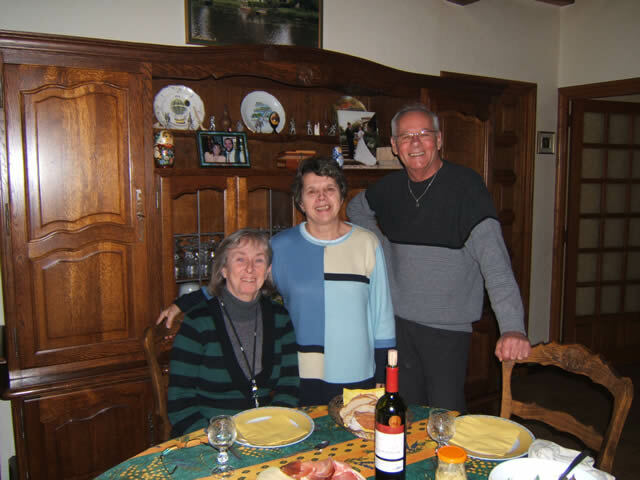 Around the same time as Pete's visit we had an invite down to the Beaujolais region to stay with Raymonde and Jean-Claude. They are always good company and a wealth of local information regarding the area. We did the usual visit to a Cave for our wine stocks and a visit to a local farm for some fresh meat products. And of course enjoyed the usual excellent French hospitality. 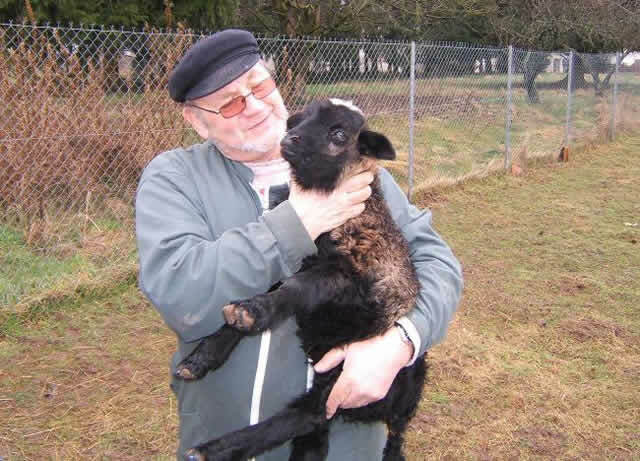 Back in St. Jean de Losne, Jean-Pierre was busy with his new arrivals (lambs). As we all know it's not always a good idea to be the black sheep of the family and one of the ewes rejected this black lamb. So Jean-Pierre took on the role of foster mother. As soon as the weather improved and the days lengthened, a few of us went by car to Mulhouse, in the Alsace, to visit the Bugati Motor Museum (now the Cite de l'Automobile or French National Motor Museum). 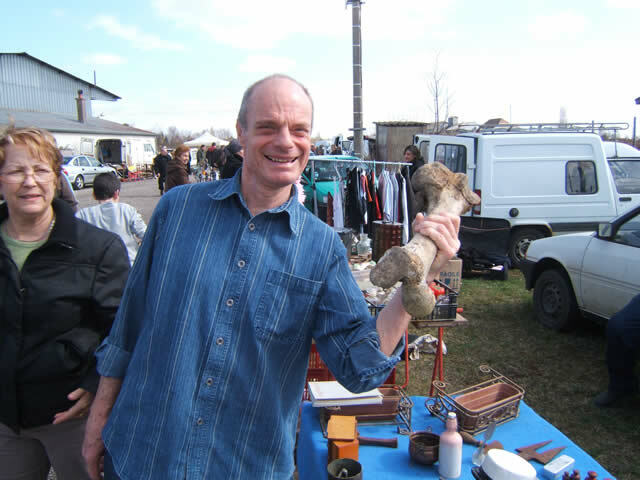 Our friend Mike Hofman organised this trip and the history of the museum is very interesting. the rest is history and the factory has become the French National Motor Museum. Our pictures weren't particularly good on the day but Vivienne came to the rescue. We can't do them all justice here, but this next photo is fascinating. 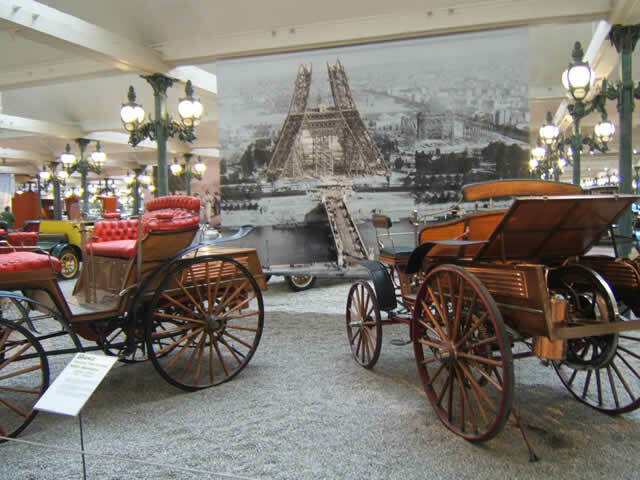 Presumably this type of car was driving around Paris at the time of the Great Exhibition! With a backdrop of the Eiffel Tower under construction! We did get the chance some time later, to try an old wine with Sylvie and Gérard. The occasion was to celebrate Gérard's birthday. The wine was bottled in the year that Gérard was born and it was still in great condition. Apparently the secret is to get it open and drunk before the air has a chance to spoil it. You could taste it changing as we were drinking it. 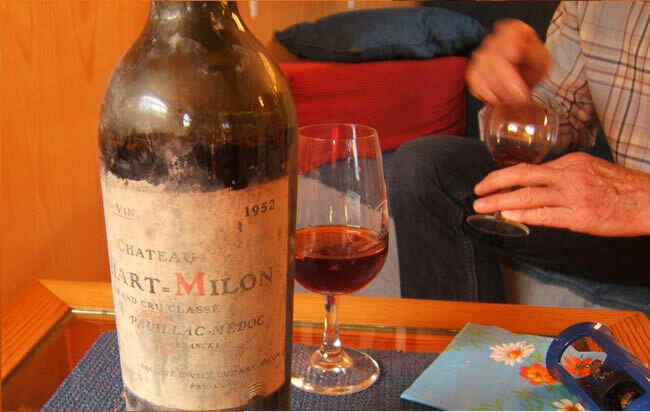 The wine in question was a Pauillac Chateau Duhart Milon 1952 - wonder if they are still around? Well, another day and another venue with an invite to Paddy and Liz's for Sunday lunch. A beautiful house set in a lovely village and always with good company. In the next picture, Steve is checking headroom for those who might otherwise go home with a headache (not caused by wine). Uschi and Pamela decided that they wouldn't have any trouble with the low beam and would be able to put up with the view of the menfolk over lunch. 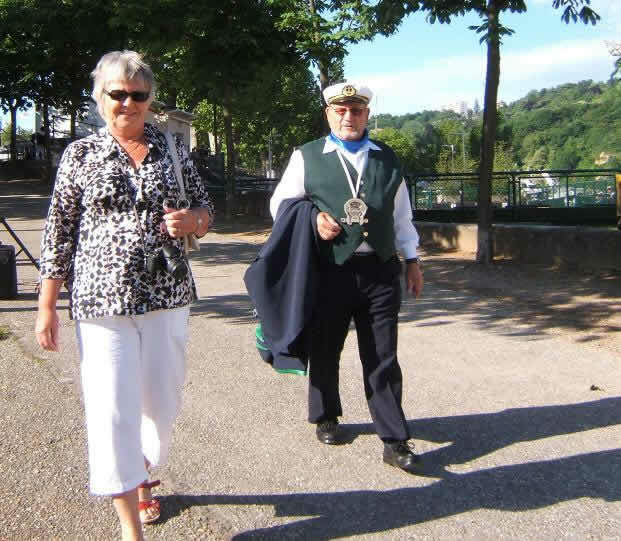 Back in St. Jean de Losne, Jean-Pierre was preparing for a trip to Lyon for the traditional Blessing of the Mariners ceremony. 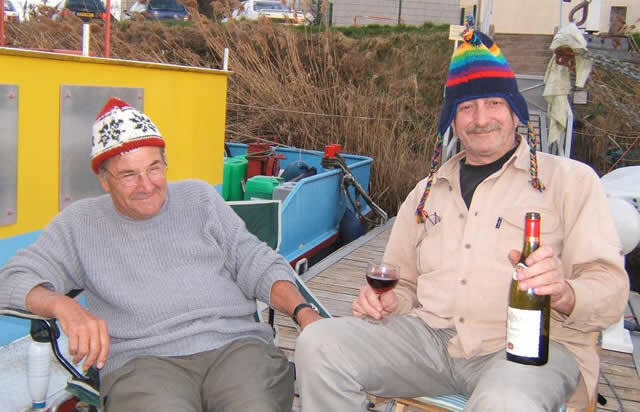 Jean-Pierre is a member of the boaters guild in St. Jean de Losne and the guild were specially invited to take part in the ceremony at Lyon by their Lyonnaise counterparts. 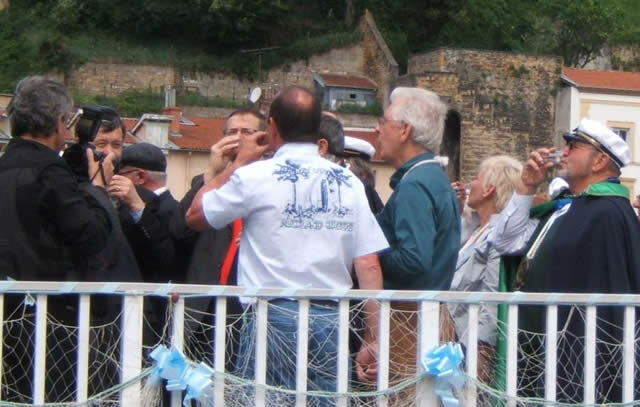 The blessing is an annual event and a similar ceremony takes place in St. Jean de Losne later in the summer. Jean-Pierre very kindly invited us along to Lyon and as you can see in our next photo of him and Ilse, it was a beautiful day. As with most events in France, drinking wine is a fundamental part of the event but not compulsory. we were only sat on the next table to the Cardinal!!! If we could only remember his name you could accuse us of name-dropping. 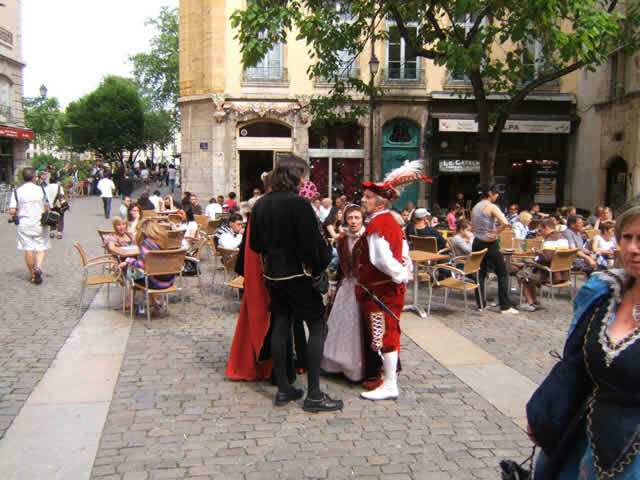 A visit to old Lyon was next on the cards and with our very own tour guide, Jean-Pierre, it really finished the day off perfectly. 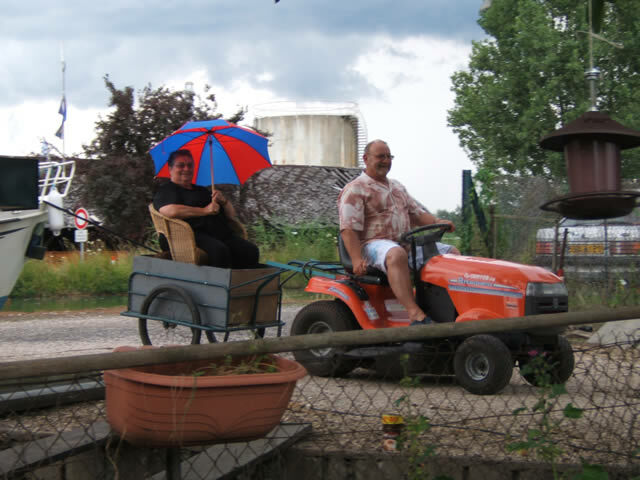 Last year we missed all the summer festivities in St. Jean de Losne as we left in late April and cruised up to the Alsace region. 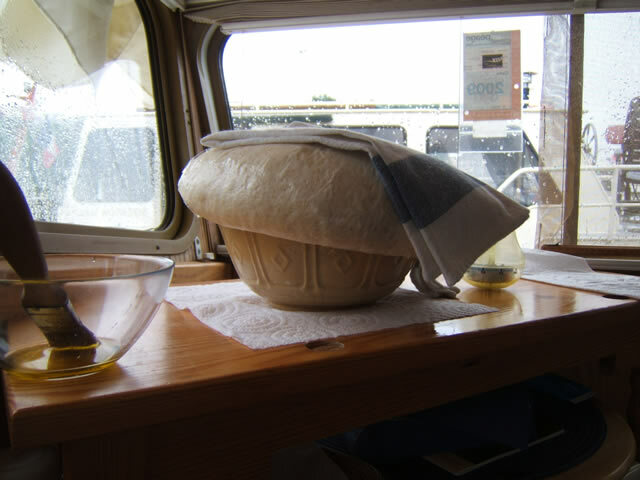 Our good friend Gaby, who is our neighbour in the winter, organised 2 events last year and one French couple described them as the best they had seen in St. Jean de Losne. So this year we decided to do short trips and return in time to enjoy them. 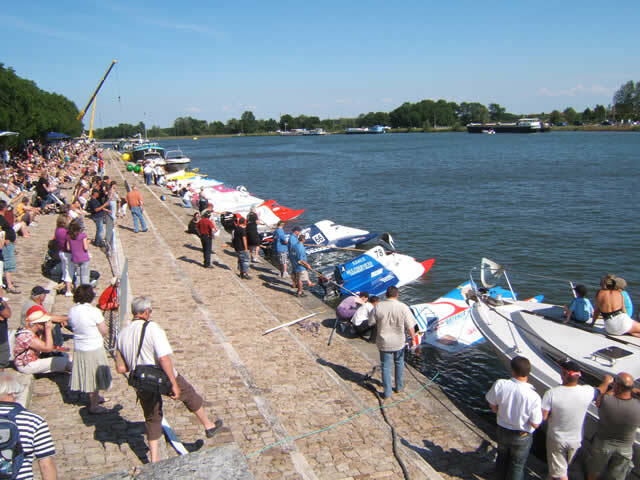 The first of Gaby's events involved a weekend of speed boat racing and extremely fast too, with speeds of up to 130 kph!! There were also some beautiful examples of boats around fifty years old, finished to a very high standard in varnished wood. .seeing this chap looking for a good shot. Just had to remove the straps that held this boat aloft. Our next photo is of the entrants lined up for a speed trial. It was quite a magnificent weekend. 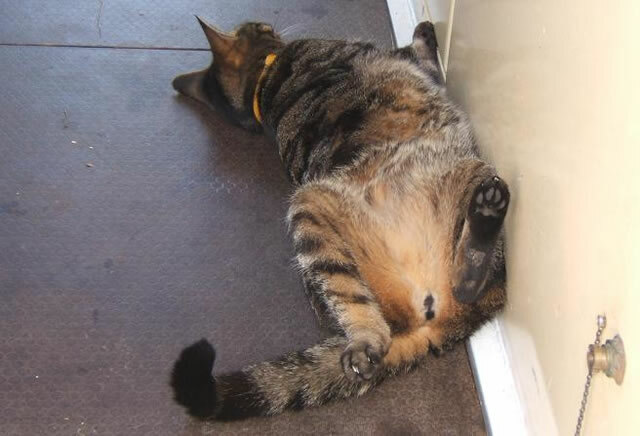 Unfortunately, there was a fatality over the weekend and at the time of writing, we are not sure of the cause. 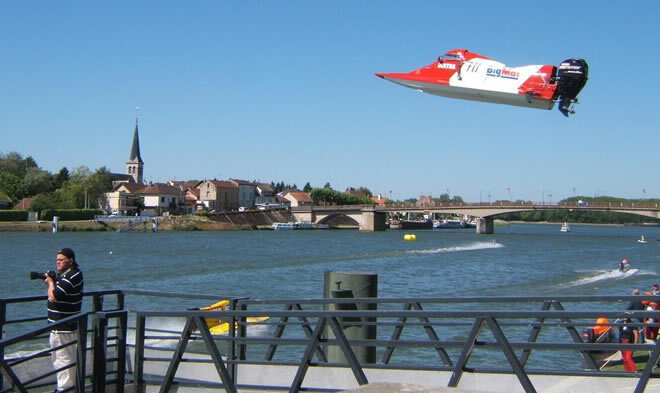 It could mean that this may be the last event of its kind in St. Jean de Losne. But lets hope not. 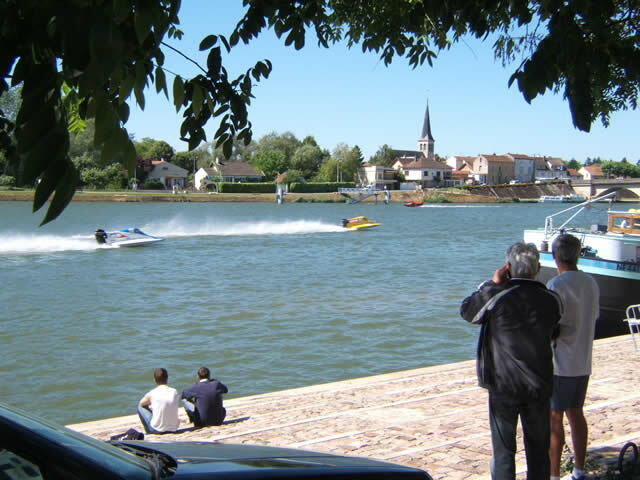 Although the loss of life was tragic, motor sports generally, including speed boat racing, contain a high element of risk. Gaby, as far as we know, is the president of the association that ran this event and he and his family put a lot of effort into its success. Well done the Beau family (and friends)! This next picture is of the last Monday morning walk of the winter season, which finished with lunch at the Auberge du Paradis. 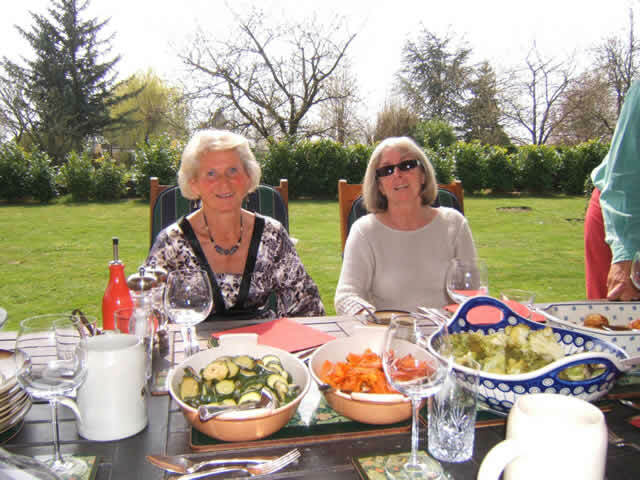 Our first major trip on the boat was to Dijon to pick up Pamela's sister Pat who was coming down from Paris on the TGV to spend a fortnight with us. 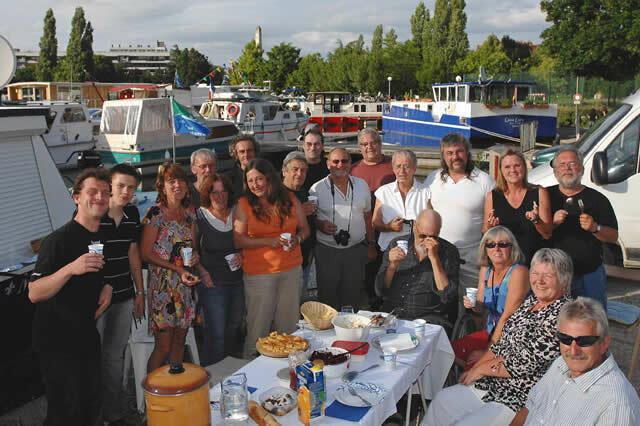 On the day we arrived in Dijon we were invited to a barbecue in the port and our next photo is courtesy of the local paper "Le Bien Public". On our way down the Bourgogne canal I took this picture of Pat, which isn't the best I've taken of her but the backdrop is typically French. Our next venue was Ann and Lawrence's barbecue in Laperrière sur Saône, an annual event as the last Franglais of the winter season. We thought that we needed a makeshift bar top on the terrace and a piece of pine we had on board looked the business. 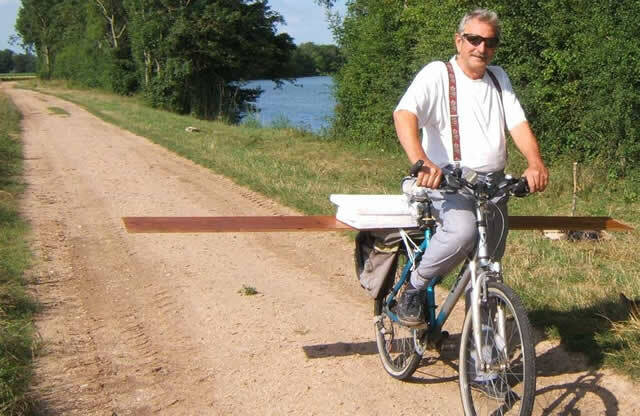 We had moored down on the river Saône, just below Ann and Lawrence's house, so it was just a matter of transporting the said bar top. Had the journey been downhill, I'm sure I might have taken off. 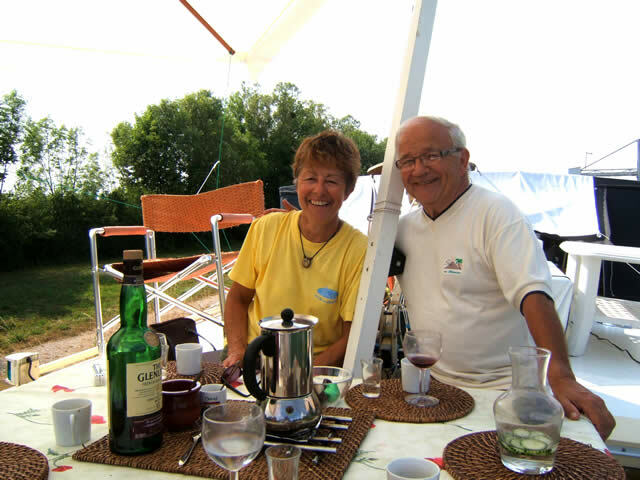 It was soon time for us to get back up the Bourgogne canal to Dijon so that Pat could catch her TGV back to Paris, Charles de Gaulle Airport. There never is enough room left in Pat's luggage so we think Gromit was going to be out of luck if he thought of escaping Lea Crest! 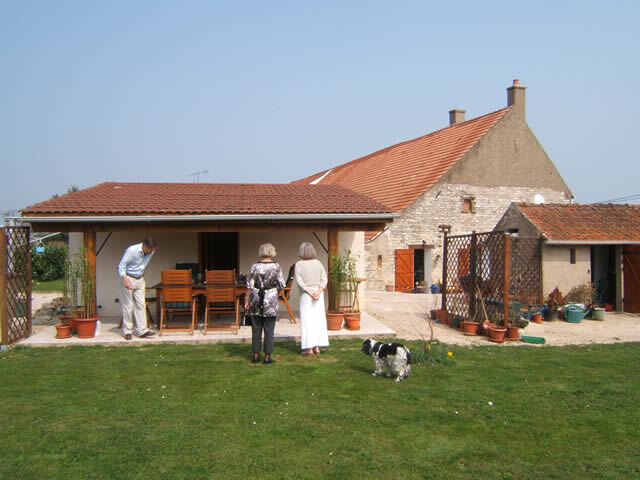 Whilst we were in St. Jean de Losne, we offered to look after Jean-Pierre's house and garden while he was away. 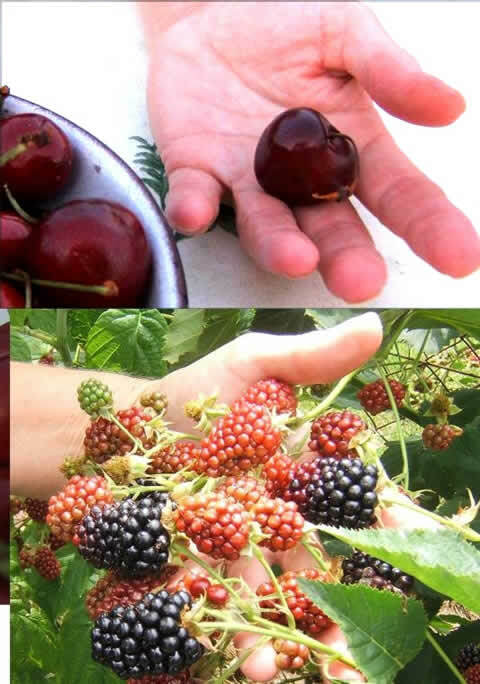 Our main tasks were plant watering and looking after the livestock (sheep, chickens and cats) and of course we had access to any ripe fruit. On Jean-Pierre and Ilse's return a double party was planned for Ilse and Michelle's birthdays. It was a great barbecue with a grand entrance to boot! 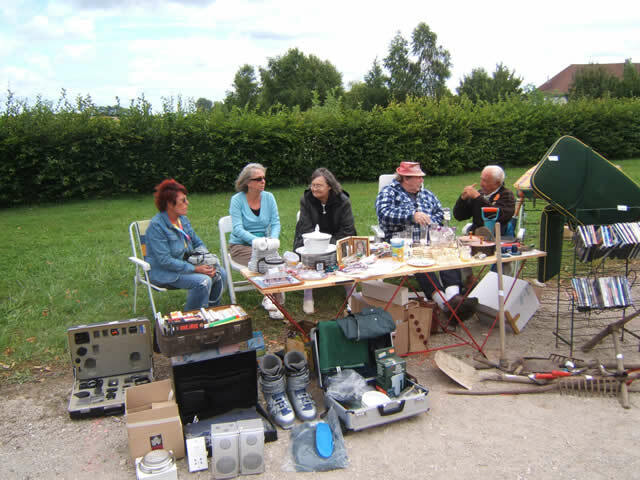 Our next stop was another trip to Laperriere where the annual Vide Grenier (empty attic), or car boot sale in English money, was being held. This would normally be held outside John and Hazel's new house. But this year it was held in the grounds of the village hall. We had decided that some things on the boat were just clutter and that it was time to get rid of some of it. After all you don't have that much space when you live afloat. We couldn't believe our luck when we managed to sell a pair of Ski boots in 30 degrees of sunshine! 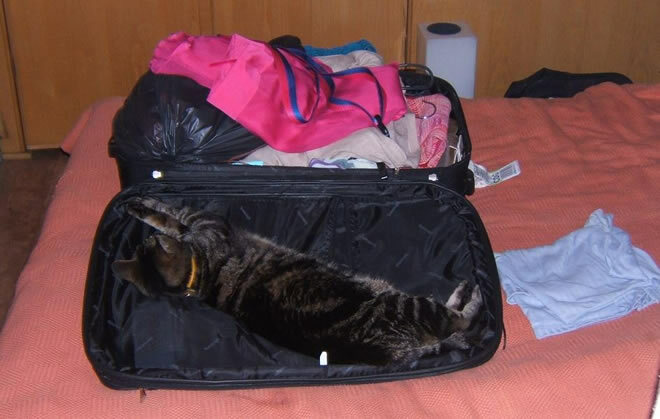 On that note, as you can see from the next photo, Gromit always manages to find a cool spot in the hot weather. Having gone backwards and forwards between Dijon and St. Jean de Losne many times, it was time to stop partying and do a little more cruising. So, for a change, we set off towards Dijon!! 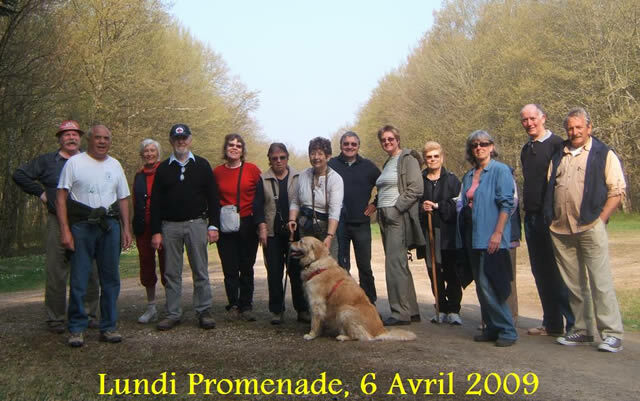 Halfway there, at a place called Longecourt, we had a rendezvous with Maguy and Gérard. They are always good company and it was a great stopover. Gérard had recently been on local TV being interviewed about the Gym in Longecourt as he was instrumental in its founding and this year they are celebrating its 25th anniversary. Well done Gérard! So we are nearly at the end of this update. 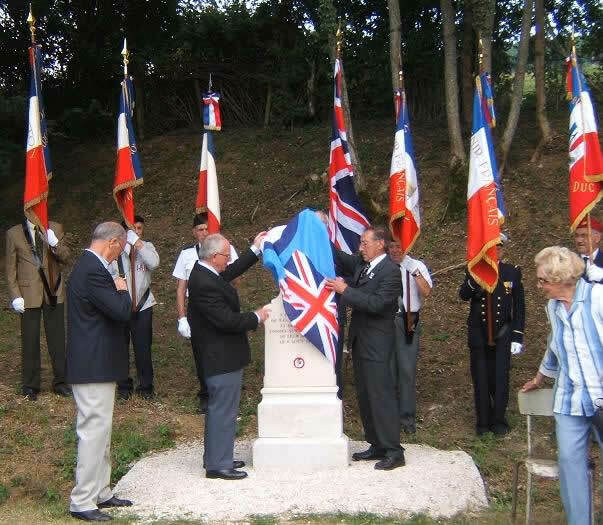 Except for an event that happened just up the canal in a village called Vandenesse, where 2 English airmen are buried in the churchyard. The local townspeople thought it right to make a more fitting memorial to the airmen and the ceremony was to be held on the following Saturday. All we needed was a lift to the village. So as our friend Mike Hofman is always interested in such events, we cheekily invited him to join us, on the proviso that he didn't come in his 2 seater! 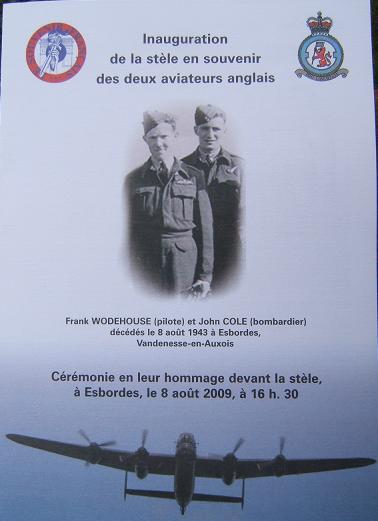 The new memorial was placed in Esbordes about 100 metres from where the aircraft actually came down. The sad story was that in 1943 a Lancaster bomber, with a crew of 7, was on the way home from a bombing raid in Milan, Italy. German fighter planes based at Dijon airport were scrambled and attacked the Lancaster. Subsequently the Lancaster caught fire so the pilot gave the order to evacuate the plane. Five of the crew were able to get out but the pilot Frank Wodehouse and the bomb aimer John Cole perished when the Lancaster crashed. Luckily the locals of the area were first on the scene and dealt with the situation. The German authorities were furious but they were unable to find any of the aircrew. The 2 dead airmen were buried in secret and their graves marked as though they were French children. Four of the 5 survivors were hidden and eventually repatriated at which time a coded message was sent via radio London saying that "the Burgundians have arrived". The 5th survivor was unfortunately seriously wounded and spent the rest of the war in a local hospital. We were amazed at the number of people, 66 years on, who attended this ceremony. There seemed to be an equal amount of French to English on the day and we found it to be very moving.